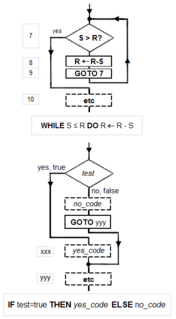 In mathematics and computer science, an algorithm ( i/ˈælɡərɪðəm/ AL-gə-ri-dhəm) is a self-contained step-by-step set of operations to be performed. Algorithms perform calculation, data processing, and/or automated reasoning tasks. The English word 'algorithm' comes from Medieval Latin word algorism and the Greek word "arithmos" (ἀριθμός). The word 'algorism' (and therefore, the derived word 'algorithm') comes from Al-Khwārizmī (Persian: خوارزمی‎‎, c. 780–850), a Persian mathematician, astronomer, geographer, and scholar. English adopted the French term, but it wasn't until the late 19th century that "algorithm" took on the meaning that it has in modern English. In English, it was first used about 1230 and then by Chaucer in 1391. Another early use of the word is from 1240, in a manual titled Carmen de Algorismo composed by Alexandre de Villedieu. The example-diagram of Euclid's algorithm from T.L. Heath (1908), with more detail added. Euclid does not go beyond a third measuring, and gives no numerical examples. Nicomachus gives the example of 49 and 21: "I subtract the less from the greater; 28 is left; then again I subtract from this the same 21 (for this is possible); 7 is left; I subtract this from 21, 14 is left; from which I again subtract 7 (for this is possible); 7 is left, but 7 cannot be subtracted from 7." Heath comments that, "The last phrase is curious, but the meaning of it is obvious enough, as also the meaning of the phrase about ending 'at one and the same number'. "(Heath 1908:300). Euclid’s algorithm to compute the greatest common divisor (GCD) to two numbers appears as Proposition II in Book VII ("Elementary Number Theory") of his Elements. Euclid poses the problem thus: "Given two numbers not prime to one another, to find their greatest common measure". He defines "A number [to be] a multitude composed of units": a counting number, a positive integer not including zero. To "measure" is to place a shorter measuring length s successively (q times) along longer length l until the remaining portion r is less than the shorter length s. In modern words, remainder r = l − q×s, q being the quotient, or remainder r is the "modulus", the integer-fractional part left over after the division. For Euclid’s method to succeed, the starting lengths must satisfy two requirements: (i) the lengths must not be zero, AND (ii) the subtraction must be “proper”; i.e., a test must guarantee that the smaller of the two numbers is subtracted from the larger (alternately, the two can be equal so their subtraction yields zero). But exceptional cases must be identified and tested. Will "Inelegant" perform properly when R > S, S > R, R = S? Ditto for "Elegant": B > A, A > B, A = B? (Yes to all). What happens when one number is zero, both numbers are zero? ("Inelegant" computes forever in all cases; "Elegant" computes forever when A = 0.) What happens if negative numbers are entered? Fractional numbers? If the input numbers, i.e. the domain of the function computed by the algorithm/program, is to include only positive integers including zero, then the failures at zero indicate that the algorithm (and the program that instantiates it) is a partial function rather than a total function. A notable failure due to exceptions is the Ariane 5 Flight 501 rocket failure (4 June 1996). The words 'algorithm' and 'algorism' come from the name al-Khwārizmī. Al-Khwārizmī (Persian: خوارزمی‎‎, c. 780–850) was a Persian mathematician, astronomer, geographer, and scholar in the House of Wisdom in Baghdad, whose name means 'the native of Khwarezm', a region that was part of Greater Iran and is now in Uzbekistan. About 825, he wrote a treatise in the Arabic language, which was translated into Latin in the 12th century under the title Algoritmi de numero Indorum. This title means "Algoritmi on the numbers of the Indians", where "Algoritmi" was the translator's Latinization of Al-Khwarizmi's name. Al-Khwarizmi was the most widely read mathematician in Europe in the late Middle Ages, primarily through his other book, the Algebra. In late medieval Latin, algorismus, English 'algorism', the corruption of his name, simply meant the "decimal number system". In the 15th century, under the influence of the Greek word ἀριθμός 'number' (cf. 'arithmetic'), the Latin word was altered to algorithmus, and the corresponding English term 'algorithm' is first attested in the 17th century; the modern sense was introduced in the 19th century. ↑ Moschovakis, Yiannis N. (2001). "What is an algorithm?". In Engquist, B.; Schmid, W. Mathematics Unlimited — 2001 and beyond. Springer. pp. 919–936 (Part II). ISBN 9783540669135. ↑ For instance, the volume of a convex polytope (described using a membership oracle) can be approximated to high accuracy by a randomized polynomial time algorithm, but not by a deterministic one: see Dyer, Martin; Frieze, Alan; Kannan, Ravi (January 1991), "A Random Polynomial-time Algorithm for Approximating the Volume of Convex Bodies", J. ACM, New York, NY, USA: ACM, 38 (1): 1–17, doi:10.1145/102782.102783 . ↑ Oaks, Jeffrey A. "Was al-Khwarizmi an applied algebraist?". University of Indianapolis. Retrieved 2008-05-30. 1 2 Cooke, Roger L. (2005). The History of Mathematics: A Brief Course. John Wiley & Sons. ISBN 9781118460290. Axt, P (1959). "On a Subrecursive Hierarchy and Primitive Recursive Degrees". Transactions of the American Mathematical Society. 92: 85–105. doi:10.2307/1993169. JSTOR 1993169. 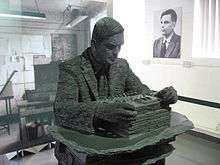 Turing, Alan M. (1936–37). "On Computable Numbers, With An Application to the Entscheidungsproblem". Proceedings of the London Mathematical Society, Series 2. 42: 230–265. doi:10.1112/plms/s2-42.1.230. . Corrections, ibid, vol. 43(1937) pp. 544–546. Reprinted in The Undecidable, p. 116ff. Turing's famous paper completed as a Master's dissertation while at King's College Cambridge UK. Hodges, Andrew (1983). Alan Turing: The Enigma ((1983) ed.). Simon and Schuster, New York. ISBN 0-671-49207-1. , ISBN 0-671-49207-1. Cf. Chapter "The Spirit of Truth" for a history leading to, and a discussion of, his proof. Jean Luc Chabert (1999). A History of Algorithms: From the Pebble to the Microchip. Springer Verlag. ISBN 978-3-540-63369-3. Algorithmics. : The Spirit of Computing. Addison-Wesley. 2004. ISBN 978-0-321-11784-7.